*Note: I originally shared this on the STM Forum, which is absolutely the best community of marketers sharing ideas and insights on the web. There has been alot of chatter lately about using Afflow/Monetizer/YTZ and Amy has produced an excellent 8-part series on the topic. I put together a tutorial video to share with you my simple method of using Zeropark and Afflow to quickly find some profitable segments. This is a great method for beginners to get their feet wet and you can reach $20-50/day profit very fast using this approach. Many times these types of campaigns do not last too long (a few days) but occassionally you may find some that last longer. If you are very organized, you can maintain several of these campaigns and perhaps make the revenue more stable. My process for launching and testing with this method. How to setup your link in Afflow. How to setup your campaign in Zeropark. How to review the stats and decide what is working. Here are the instructional slides found in the video, I like to call this method “Find the Honey” because its simple and sweet! STM is the first place I’ve shared this content and I hope you find it helpful! Please feel free to ask questions or leave me some feedback! Hey, guys I’m Andrew. Also known as Mr. Payne on the forum, so now you can put a face to that name that you’ve seen so much around. I wanted to shoot this quick video, because I’ve noticed recently there’s been a lot of great content put out about how to use Afflow, also known as monetizer, and services like YTZ. There’s been great information put out about that, and I’ve seen that there’s been a couple of follow alongs started as well, some beginners are using that to get their feet wet, get off the ground. I thought I would chip in and show a strategy that I like to use to quickly find some converting segments, and usually I can make a little bit of money right away, within about 24 hours, sometimes less than that. I can find something that’s working, and target that really well, and get some money coming in. Usually I start with a test of about 100 bucks, find three or four geos and verticals that are working, and then I bounce over and target those areas specifically, and start making some money with that. I wanted to show you my strategy. I mostly use it really for when I’m not motivated or I’m having a hard time finding some big campaigns, and I just want to get some conversions coming in to get my heart rate beating a bit, but maybe you’ll find it helpful, and I wanted to share it with you. You guys are the first people to see it so feel free to leave me a comment below, let me know what you think about it, and I hope it can help you in some way. Let’s take a step back to my desk, and I’ll show you exactly how to do it. All right, so the first thing that we want to do is to log into Afflow. I’m not going to show you how to set up your whole Afflow account, but I’m going to show you how I create my links when I’m going to run a test. Let’s go down here to the campaigns tab, click on links, and then we want to click on the create link button. We can see several options here. What I do for global campaign test is I keep it at V auto, which essentially means the Afflow algorithm is going to use what it knows is working best in every geo, and based upon the traffic segment type. Leave it at V auto. I have a default domain selected. I’m going to choose a league as global tests, and a lot of times I like to put in my own names. What we’ll do is video, aggressive. [Aggr 00:02:29] stands for aggressive. This is me setting up an aggressive link, I put the link name usually the same thing. We’re going to be running it on Zeropark, so we leave that alone. All this stuff will be populated if you do your Zeropark integration with Afflow. We want to make sure that all of these items are enabled, so LP exit pop let’s make sure that’s enabled, all of these are enabled, 10 seconds, monetize desktop traffic, yes. We also want to add these in, but we’ll do that in just a moment. For a general global test I don’t ever select anything different on these four options below the V auto options. Offer targeting, white listing, and routing. I always leave that the same. What I’m going to do is click create now. It’s telling me that I need to have a balance link create, which we’ll do that in just a moment here. Let’s go back actually, click done, I’ll go back into the same link that I just created. We’re going to go to balance link, and we’re going to select the link that I just created, so what this is going to do is it’s going to serve a pop up that goes through the V auto link. Then when they try to bounce or exit, sorry not bounce or exit, but the back button bounce is going to send them right back through the same exact link. It may or may not show them the same offer, but it’s going to send them right back to the same link. I also like to do the same exact thing for the pop under link. I click the same link, so essentially I’m just really aggressively promoting them through the same exact link no matter what they do, so that’s how I like to do it. Then we’ll save changes. Then we’ll go to show promotion methods, and this is where you have your different links, so this would be the link that we grab right here, and you’d put that link directly in your tracker. Now let’s go over to my tracker, and I’m going to show you guys a test that I ran back in November. I don’t use this method very often. It’s not my core strategy, it’s not how I make a lot of money. There probably are those who are making a good chunk of change using Afflow, and I’ve spoken to several who have, but me personally it’s not my primary strategy. But once in awhile I like to run it, it’s fun, it’s usually almost every single time I run it I get some solid conversions, and I tend to stick with Zeropark, and pop ads most of the time when I’m running my tests, but I also run tests on other traffic sources as well from time to time. As you can see here I have a couple of links setup. I’m not going to setup the one that we just had, but you take that link that we had right there, grab that, add it to your tracker setup a campaign that’s direct linking to that one specific link, which would be like this one here. Monetizer, global, link aggressive. I had this one setup which was not an aggressive one, but I had to change it over real quick, because I didn’t want traffic going into that one. This was a small test of something, I’m not even sure, but anyways. As you can see on this test, this was back in, this was about November 10th I believe last year, so just a few months ago I spent 100 dollars almost right on the dot, 100 dollars. Well, 100.19, totally revenue was 43 dollars over this whole campaign, so it came in at about a negative 56 percent ROI. Usually when I do tests like this the initial 100 dollar test is anywhere from a negative 40 percent ROI, to negative 60 percent ROI, somewhere in that ballpark is where it usually falls if you follow what I’m sharing. The cost per view, which is the CPM I was literally bidding only 10 cents, which fortunately Zeropark let’s you do that. You can see the total number of visits, and so forth. Another great benefit of running this test if you have Voluum, and using Zeropark is that all of the traffic events are completely free, so there’s no cost to that. That’s a great perk if you’re trying to be mindful of your budget, and get some momentum going with your affiliate marketing efforts. What I want to do real quick is show you guys the results that I got by the country, and I’ll show you the mobile carriers, and some other data, and so forth. It shows you how you can take segments that are profitable really quickly, create new campaigns targeting just those segments and make some quick profits usually in under 24 hours, so once you get all of your results coming in, and all the delayed conversions show up between 12 and 24 hours you have some very actional data to work with, and you can setup some new campaigns, and start profiting. Let’s go over here to the county section of this campaign test, and for now I’m going to sort by total number of visits. As you can see there’s traffic from all kinds of different geos. I went into Zeropark and I literally selected every single possible geo. Now keep in mind when you’re running these kind of tests I like to try to spread it out over a 12 hour period, or close to that, because you have different time zones, different times of the day, so one geo might not work very well right now, but in 12 hours from now when it’s daytime in that geo it could potentially work. It’s a great idea to maybe run two tests, one over a first 12 hour period, and then the second test over a second 12 hour period that way you get a full 24 hours of testing, but you can follow the method that I’m talking about. What I typically like to do is I like to sort by total conversions, and this lets me know what geos are actually showing conversions, and I typically only pay a lot of attention to geos that are converting four, five, six conversions, or more with my initial test. As you can see most of these geos got anywhere from a 1.50, well even as low as nine cents here. 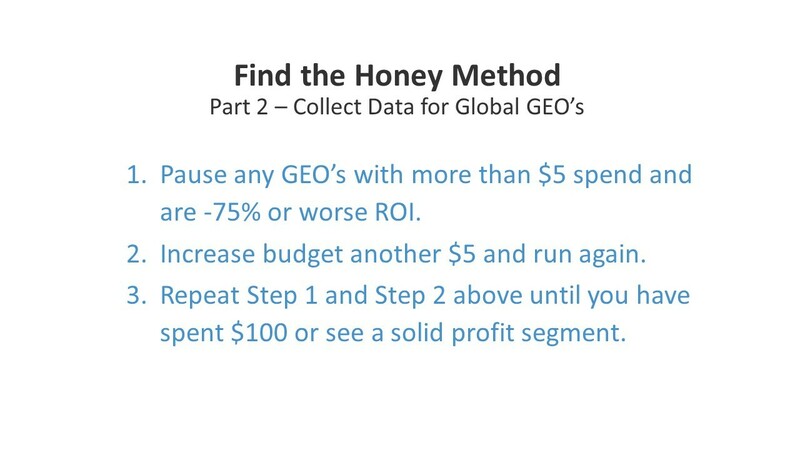 But you can see there’s been a lot of different geos between a few cents up to four, five dollars is really what’s being spent per geo, but it’s enough data coming in to get some initial results. What you can see here is when you look at the ROI column, 220, two percent ROI, 255 percent ROI, 105 percent ROI, 160 percent ROI, so these are showing great signs. Typically I look for anything that’s negative 50 percent ROI or better, because a lot of times when you dive into it a little bit further you see that the mobile carrier, or a particular operating system like Android, or IOS is doing really well, and in some cases there might be just one really awesome placement that’s doing all the conversion. If you’re targeting just that it turns that campaign profitable right away. What I want to do next is go to the grouping here, and I’m going to choose mobile carrier, and we’ll click apply. We’re going to change this to table, because what I want to do is show you, see what the best absolute segments are that’s working. Let’s see the first one that’s getting us the most conversion is in the country of Ukraine. The mobile carrier I’m not even going to attempt to pronounce that, but that’s the mobile carrier. If you look here I got 2,275 visits, and 31 conversions. I literally spent 27 cents, and I made five dollars, that’s a huge ROI, look at that right there. 1900 percent ROI, five dollar profit from just a quick simple test. Now, what I would suggest doing is going inside of Afflow, you can look at your stats in Afflow, and find out the exact offer in vertical that is converting for this country under this mobile carrier, and that would create a new link that’s targeting just that particular offer. Some people like to add then multiple offers, or keep it open to the entire vertical for that geo, but I prefer to just target that specific offer, milk the best offer while it’s still available, and then move on from there. But if you look out of my initial test I have the Ukraine, here’s Mexico with the mobile carrier Movie Star. I spent one penny, literally one penny, and it made two dollars, and 52 cents, which is a great huge ROI, but again this is small volumes. But if you see here you have Brazil, you could look and dive a little bit further into the stats for Brazil and see what’s up, same for Morocco, Thailand, here we go Australia. This is a four cent offer, and it’s converting at 38 percent, that’s huge, and just a little bit of traffic coming in. I would take all of these that are already showing a high ROI, again crate their own specific link in Afflow, create a new campaign for each individual country targeting just those carriers, and setup a campaign to target using just that new link for that one geo, and carrier, so you’ll have a handful of little bitty campaigns, but collectively you could be doing 50 to 100 dollars a day in just a day or two after you’ve run the initial test results. If you look right here even this one here, Malaysia. You have this one down here that’s a potential, which is Indonesia with the carrier XL. Some of these the volume is really small, so the sample data may not be enough to really say, okay it’s going to be a good profit campaign, but when you get to the ones that are like this, 10 plus conversions, especially Ukraine then you can definitely make good money off of it for a couple of days, so definitely dive in and do so. I can tell you for sure, since this campaign is a little bit older I did run through and revisit the Australia four cent offer one, and I did make some good money off that for a few days as well as some of these other ones that you see here. Just to give you a little bit further example let’s break things down a little further. Let’s go into this drilled down report, or just break it down this way, here we go. Sorry, it’s a little bit older data, so it’s taking a moment here to load up. We got the Ukraine, we’ll go over here to the mobile carrier. Come on. We can see that wifi got one conversion, but look at the ROI. We don’t want to deal with any of these because none of these converted, but this one’s converting like crazy, so let’s click on that, dive down a little bit further. Just to get a idea of what’s working let’s click on OS. We want to see what OS is driving all the results. As we can see here pretty much all the traffic is coming straight from Android, so the next thing we want to do is let’s go over here to target, and let’s see if it’s converting by a bunch of different placements, or if they’re just a handful of different placements that are converting. All right. Great. Look here. There’s about, I don’t know how many actual placements are sending traffic, but not a ton, but if you’ll notice most of the conversions are coming from just about 10, or 15 placements right now. There could potentially be more than that, but you know for sure that you could be bidding up pretty quickly on these, and get some quick traction coming in. But even if you’re targeting just these from just a small test of, you know, half an hour, or an hour, or however long the test went for this particular geo. Look at these ROIs coming in from that, so you can quickly make some easy cash doing this, and so this is a great way to know you target Ukraine, target this mobile carrier, and you setup a campaign that’s targeting just the Android OS since we notice that all the traffic is Android that’s working. We can also check devices just to make sure it’s all coming from a mobile device. If you notice here it’s coming from both mobile and tablet, so I would suggest targeting both mobile, and tablet. Then for this campaign I would target all, I would run a RON campaign on Zeropark, and just target everything, but then just watch it, and anything that’s not converting really quickly, or at a profitable rate just blacklist those placements. Let’s see if there was any bad placements that could’ve been blacklisted in this here. We’ll sort by a total number of visits. Look at this one, the very first one 150 visits, zero conversions. It only spent a penny, but more than likely it’s not going to convert a lot. It’s possible so I wouldn’t cut it out right now, but if you notice the ones that are converting really well are already converting multiple times off of just a couple of pennies, so if you want to get the profits really quickly just cut everything that’s not converting really quick, and focus on those that are getting multiple conversions very quickly. That means you’re going to cut all the bad placements out, and focus on just what’s working right away, and start making profits. What I want to show you real quick is going back to Afflow. Let’s say that we’re creating a new link after you’ve found a geo that works well, and a vertical that works well, and if you dive into your stats under Afflow you can really look at exactly the vertical, and specifically the offer number that they’ve assigned, that’s working well. What I like to do is I like to come back, take that vertical, and let’s say that vertical is apps, and then I’ll re-setup everything just like I did the first time. Same thing with the pop under, the balance link, all that stuff make sure this is all enabled, and then I go to offer targeting, and now I type in the country, which you’ll say Ukraine. I select just Ukraine, because I want to be very specific, and if you notice for Ukraine targeting apps these are all the offer numbers that they’re rotating. Now sometimes I let it rotate all the offers in that vertical, other times if say this was the offer that was performing really well in my Afflow stats I will target just that one offer, and let it run, because a lot of times these other offers may not be performing at all, or just at a much lesser rate, so I just want to milk it while I can, and I target just that specific offer. We’re targeting Ukraine, just this particular offer, because we know that that’s working with the carrier, and everything that we have been targeting. Yeah, so there we go. I don’t really mess too much with these other things. You can do the carriers if you wanted to, but it’s easier just to keep it all carrier, because we know that this offer is working for the carrier that we’re going to be targeting on the traffic source, so at that point again you click create. Of course I don’t have everything setup, but you create it all, setup a new campaign, add this to your tracker, and you’re good to go, and you should start profiting. Again set your bid low, I would set a small budget, and kind of do the same process to just see what’s working, and cut out what’s not working pretty quickly. I put together just a quick slide to show you the process what I like to call find the honey method. Part one is just setting up your initial Afflow link, and setting up your initial global Zeropark campaign, which I can run through in just a moment, and show you kind of the general way to set that up. 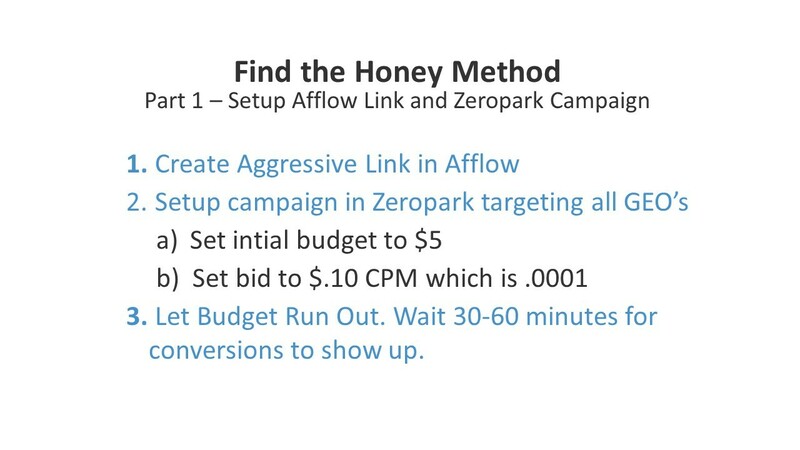 What you want to do is make sure you create an aggressive link in Afflow, set up the campaign in Zeropark, targeting all the geos, set your initial budget to only five bucks. Reason why is because you’re targeting all the geos you’re going to get a tremendous amount of traffic, and it’s going to blow through that five dollars very quickly, but if you set the budget low, Zeropark’s system is going to stop the traffic as soon as it can, and you’ll probably end up with like 10 or 15 dollars in spend, which is fine, that’s what you want, because it’s spread out across so many different countries, but always keep your initial budget very low. Same thing with your initial bid set your initial bid at 10 cents, CPM, not 10 dollars, not a dollar, 10 cents. Which is .0001. Let your budget run out wait about 30 to 60 minutes, because conversions are a lot of times very delayed in Afflow, just the way the system is setup. Sometimes it’s real time, sometimes it’s not it’s going to depend on the offer, and who it’s coming from. There’s a lot of times where you’ll still get conversions hours, or even up to 24 hours or so later, so usually the majority come in pretty quickly though. But you want to wait before you do any other budget adjustments to the campaign. You want to make sure something’s working, and not just blowing through all your budget. Part two to this is you want to collect data for the global campaigns, for the global geos rather. You want to review the data, pause any geos in Zeropark with more than five dollar spend, and are negative 75 percent ROI or worse. That’s because it’s just not showing a lot of potential early on, so you want to conserve your budget and be safe with that. The next thing you want to do is increase your budget another five bucks, and then repeat the process, run more traffic again, let Zeropark shut down traffic once it hits your budget, and you can reanalyze the data once again. Pause any geos that are not performing, or that have spent five bucks, and are worse than negative 75 percent or worse. Now, if the geo has spent five dollars, and it shows sign of life, like it has potential. I usually still pause it, and go ahead and start diving into the details of it, and to setup a new campaign, so you don’t have to keep running traffic to something that’s already working just go ahead and move that to it’s own campaign, and let the rest of your task budget go to the other geos that you’re still trying to test. I usually spend about 100 dollars on that initial test that I try to spread out over an eight to 12 hour period. Sometimes it doesn’t last that long, but as long as you’re getting some conversions coming in, then I usually kind of let it run, but the main thing is you want to spread that budget out across as many geos as possible to see what’s actually working, and give each one a good chance. 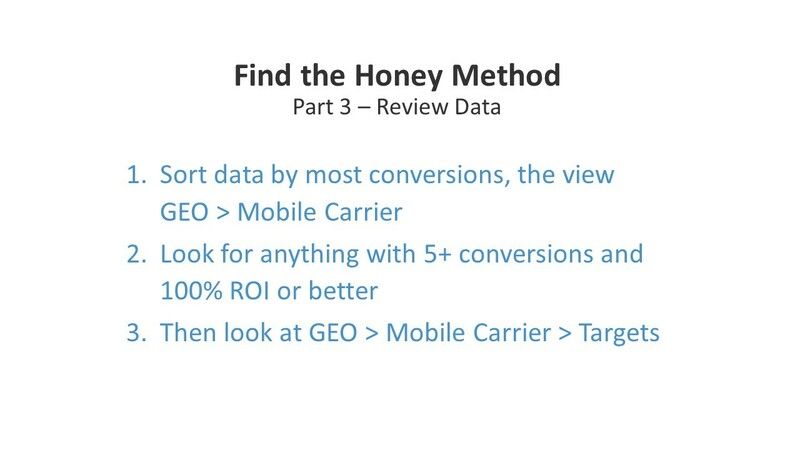 The third part is you want to review the data, like I just showed you in my tracker you want to go through and sort the data by most conversions, and then click the view that shows you the country, and the mobile carrier that’s performing well. Look for anything with five plus conversions, and 100 percent ROI or better, that’s just kind of like a basic line to kind of judge things by, obviously you can use your own judgment, and as you start to use the method like this things might expand, and you could be a little more flexible with that line if you prefer to. Then you also want to look at geo mobile carrier, and targets just to see if it’s converting across a lot of different placements, or if it’s converting across just a handful. Make sure you also check your operating system Android, IOS just to see what’s working, and your device type just to make sure that when you setup the new campaign that you’re targeting only what’s actually converting in your initial test. That way you don’t waste any spend, or time, and you just start making some green profit right away. 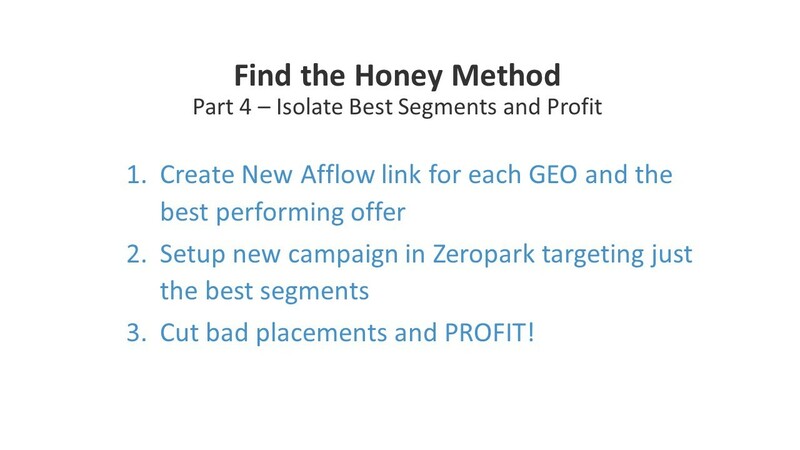 Lastly, this is isolating the best segments, create the new Afflow link for each geo, and the best performing offer, setup a new campaign in Zeropark targeting just those best segments, like I just mentioned, and then right away take the same process. Bid low, start with a lower budget, and monitor the data coming in. Cut any placements that aren’t converting, like on those low payout offers if things aren’t converting really quickly you probably just go ahead and block those placements, and that’s it. That’s how you can quickly jump into making extra profits. Now I’ll just quickly show you how you can setup that campaign in Zeropark. You can simply go to new campaign, premium PPV, you want to go to multi geo, click on run campaign, type in your campaign name, click over here to countries, we’ll just say test campaign. Go to countries, I’d do select all, again set your bid to .0001, set your budget to five bucks. Go to show all, I like to click on mobile, and in this case I usually leave it just as is. I don’t change anything. I want to get as much crazy traffic as possible. I go to the frequency filters, I click on 24 hours, I do both adult, and non adult. For day parting, nothing gets changed, and you add your campaign link right here. Click save, and you’re good to go. Right away your campaign is set. You can run this kind of campaign all the time, so you can use one campaign, and that one global link that you setup in Afflow, and then just occasionally revisit this, and retest that day, or that week, or whatever you’re wanting to do, and get things rolling from there. I hope this helps you guys, get you some ideas. It’s really geared for the beginners, or the [newbes 00:24:28]. Those who are just trying to get their feet wet, and not lose a lot of money, but they want to get some traction going with their affiliate marketing efforts, and just ultimately you can see some conversions coming in right away, and see some green profit, which is always a mental boost, and it just kind of helps you take that next step. Cheers, guys. I just posted this on STM, so this has not been published anywhere else, so for now it’s exclusive to you guys. But shortly it will be published on my blog that I’m launching soon, so stay tuned for more information. I’m going to try to put out some more content like I have been in the past on STM. I’ve been really busy lately, but I want to kind of give back some more, so cheers, guys. Yo, great video and great website Andrew! That is one challenge with this method because you are bidding so low, it’s harder to scale. But what I usually do is look at the individual placements I am getting conversions on and I adjust my bid to about 70% of that placements EPV. So if placement XYZ is getting an EPV of .0025 I will adjust my bid for this placement to .00175 – this works pretty easy on sources like Zeropark but for something like PopAds you will need to setup 1-3 campaigns and put your high bid, mid bid and low bid placements into campaigns of their own so you can more accurately adjust the bid and maintain a good ROI. Another tip is you can try testing the frequency cap, adjust it from 1/24 to 1/12.. if that works well, then try removing frequency cap completely. I think I understand your meaning but yes, you do need to understand how to read your statistics and make appropriate decisions based on that. 1) Why does your monetizer platform interface looks different from mine, is there any difference ? 2) I read the FAQ point number 7 states that we cant run direct offers in their platform. Is that so? Since we will drill down to the specific offers once we found the “honey”? 3) As for the previous comment, i dont understand why do we need to separate the bid into 3 campaigns of different bids for popads when we were to scale it. 1. You probably have the Monetizer account and not the Afflow account. Send them a request to get access to the Afflow version, thats the one your want because it has more features. 2. Not sure what you are referring to or what the FAQ point 7 is but you use their vAuto option to let their system test offers based on your traffic type. Then once you find an offer that works, you can narrow it down to that specific offer number in Afflow, create a new link just targeting that offer and run it. You are probably seeing conflicting info because you are on their Monetizer version and not Afflow version. 3. For sources like PopAds, you are not able to adjust the bids on an individual placement level – only at the campaign level. So if you have a placement that is converting but its not profitable at your existing bid level you will want to blacklist it in that campaign and then create a new Low Bid campaign to place those type of placements in. Likewise, you want to create a High Bid campaign to push your most profitable placements in so that you can bid higher on just those placements to try and increase how much traffic you receive from them. That way you are effectively managing your bids based on the placements performance. Traffic sources like Zeropark you don’t need to worry about that because you can adjust the bid on each individual placement in a single campaign. Thank you so much for the detailed reply. Also one more question on your video, i see you initially choose monetize desktop traffic only in afflow. But later in the video, i see you chose mobile only traffic in zeropark. Is that suppose to be just mobile traffic in this case? Very informative post about Afflow, I’ve been thinking about running some traffic with them. Do you have any suggestions for testing on PopAds? Should I use one advertisement “type” i.e. popunder/popup/tabunder or run traffic to all types when starting out? Yes, PopAds is a good network to test with this method because they have good quality traffic. Usually you are unable to bid as low as you can on Zeropark but I would just start your bid low and bump it up in small increments until you have a good flow of traffic. I usually just focus on the popunder traffic type, that has most of the volume. How do you deal with the traffic “speed” on ZeroPark. For this particular reason, I recommend using Voluum because all tracking visits between it and Zeropark are no cost to you. Their infastructure can easily handle it. I don’t manage my own server for tracking so I can’t help you here. But another alternative would be to not target all of the high volume geos in your global campaign or just target geos in batches of 10 or so at a time. That should help you control the speed but may not be enough. Thanks! I may give Voluum a try although I just switched to FunnelFlux in the past month. I’m used to being able to limit impressions per second/minute on other traffic networks. In the long run, Voluum may be a better tracker for mobile campaigns due to them having a cluster of tracking servers across the world; average latency is much lower compared to having just one server. Great article, great blog and great content ! Thank you ! So I tried this method and it worked ! I could get an Offer> Carrier working. I thought about it and it could make sense since more and more people already saw or subscribed already to this offer, but I’m not sure, what do you think ? And is it true for every offer ? There’s not a specific time that an offer will stay alive and work, but many times on Afflow the offers are short lived. There can also be fluctations throughout the days of the week and many times the weekend performs better, I wouldn’t judge a declining performance until you have 2-3 days of poor performance. If an offer stops working it’s usually something wrong with the offer from the advertisers side – not much you can do about that. It’s also worth noting that advertisers do scrub at times for various reasons and there are other factors to why performance drops, it’s possible that you have been outbid on some of your best converting placements. My suggestion to you, is try and find several profitable combinations from different countries and that will help to stablize your revenue. May i know how do you monitor when the offer in afflow gets pulled down suddenly since there is no notification for it. Also is it only voluum tracker has the option of tracking the offer that the traffic was sent to? There’s no easy way to monitor when the offer gets pulled down. I have a simple tool that my developer made that allows me to automatically monitor when an offer stops converting for a certain period of time, notifies me by email and pauses my campaign. When you’re doing the initial Afflow testing, the only way to see the exact offer that was converting is to look at your Afflow stats. Voluum is just used to track your campaign performance. Thanks for the reply, just a few more questions below. 1) Which tab in afflow do you look for the offer that is converting? 2) For the domain setup, does it require a .com domain? Or any other extensions is fine? 3) How do you post the conversions back to your tracker? Via postback url? 1. You just click on your campaign link in Afflow (the link that is getting the traffic) and the stats dashboard will pop up. You can look at the Country > Offer or Carrier > Offer, etc. 2. You can use any domain, no limitations as far as I’m aware. 3. To setup your postback, just go to the Account > Profile tab and you will see a Global Postback option. I’m not exactly sure what to do…I’ve followed all of your steps, have conversion tracking setup properly and tested my Afflow link. I have well over 100k impressions and $20 spent but ZERO conversions. How do I make a decision based on this data? I only have one geo, India paused because it has spent $5. Assuming you have everything setup right, you should understand that $20 dollars is not enough spend. You have to keep in mind you are buying traffic from the entire globe and $20 doesn’t spread very far when considering the number of countries you are targeting. You can go ahead and pause India, Indonesia and Pakistan to help reduce costs. Run another $20-30 and see what results you get. 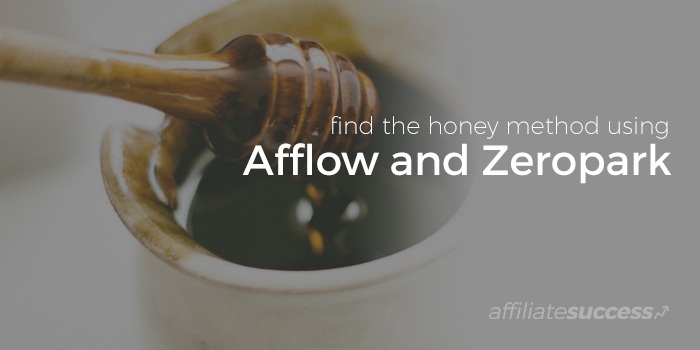 Look into your Afflow stats and make sure you are not getting a ton of cloaked traffic. If you are direct linking from Voluum, you shouldn’t have any problems. If you are using a self hosted tracker, then this could be an issue with your server being overloaded with that much traffic. Thanks, I’ll go ahead and pause those three countries. In Afflow it’s showing 99.31% cloaked traffic; what exactly does this mean? I’m using Voluum so there should be no issues related to server crashes. If that much of your traffic is being cloaked it’s very possible there is something wrong with your setup, whether its the domain you’re using, its flagged or something. I would double check everything. OK thanks, I’ll have to look into that but I’m not sure what it would be. Fresh domain not flagged and I don’t see any obvious problems with my setup. Can’t seem to figure this one out. I’ve tried 2 fresh domains and various DNS providers for the Afflow A records. Namecheap DNS / Cloudflare DNS only / etc. The my below comment regarding cloaked traffic. Hi Andrew, im getting 100% cloaked traffic as well. May i know what does cloaked traffic means? is there anyway we can test to make sure its setup properly? whats the usual cloaked % you are having? For those seeing a high percentage of cloaked traffic in their Afflow stats, here is a comment directly from Afflow support. Which you should reach out to if you need help as I do not have the ability to troubleshoot your setup. From the comments above, it’s very likely that you have your domain or link for that traffic source setup incorrectly. I would recomment that you contact Afflow support with any specific questions to see if they can help point you in the right direction and get things fixed. Appreciate it Andrew! I was also receiving a high percentage of cloaked traffic to my Afflow campaign. It seems that it was an issue with my DNS setup on Cloudflare. You said you pause country after $5 spend under -75% ROI. Do you recommend following same rule for Sources / Targets? There is no right or wrong way to do this method. I laid out a very simple strategy to follow but you can certainly test and try other things. The whole goal is to bread enough of your budget around to different countries and targeting segments, so that you have a better chance to find something that works. So yes, you can pause by Source/Target level but I tend to prefer to pause at the Country level. Test and find a method that works for you! Not the best results so far. Well, why don’t you try running more traffic to just the countries that brought you some conversions and see if they will keep converting? Collect more data and then make a decision. Yes, I do. This method is just a very very simple way to get some momentum going. When I start with a higher bid, I do not target globally, I choose a handful of GEO’s at a time to test and I only target carrier traffic. Offers with higher payouts usually have a high payout because they are harder to convert, the conversion path is more complex or it’s targeting a competitive country. Plus, you need to be able to spend an adequate amount in order to give the offers and placements a fair chance to convert. Can you do this with Zeropark and YTZ Mainstream Smart Link? You can use this method with any Smart Link, you may need to adjust your target settings according to the Smart Links requirements if any. Such as if it does not accept adult traffic. How do you deal with factoring the massive amount of traffic from RON into pricing of Voluum? 850k hits on a test run puts me at almost the cap of my $99/month 1M limit. Should I look into other solutions like PixelK to get the test data and then use Voluum for more specific targeting (I’m assuming you can import this data into Voluum)? Or would you recommend other things like only buying carrier, device or OS RON traffic and paying more for less traffic? If you’re running on Zeropark and using Voluum, there are no costs for the traffic. It does not go toward your limits. If you are using other traffic sources, like PopAds, it will use your limits and there are overages fees or an upgrade to your account may be needed. Nonetheless, if you are testing enough and find profitable segments, the extra tracking costs will be a small expense compared to your profits in most cases. Alternatively, you can look into something like PixelK if you have server knowledge and understand how to manage high volumes of traffic, keep your server and database optimized, etc. As for me, I prefer to let Voluum handle all of the server management and allow me to focus on running traffic and campaigns, so I just pay the extra expense as needed. Are there any concerns when targetting an exact domain name with their direct competitor? Example promoting a coca cola ad on http://www.pepsi.com on pepsi.com? No there should not be an issue promoting one competitor on another competitors domain. Hey Andrew thanks for putting this up. Looking to use this to get into cpa aff marketing again. 1. Is this still viable way to make $20-50/day in Sept 2017? 2. Do you know of any resources that can teach me how to automate some of this (bidding, Afflow API, etc.)? 1. Yes, this method still works but I would encourage you to learn how to run normal campaigns first. That include landers and offers on traffic sources. 2. STM is your best resource for this but you will not find specific details on how to automate your bidding, Afflow API or other automation. This is something that you have to learn and develop based on your own experience and preferences. Could you recommend any normal methods? You’ve already asked something related to this on another comment. Thank you for sharing this great method. I am new in this field could you recommened me any strategy to test it as a start? I am already member in stm if u need to tell me anything there. You haven’t given me much information. I would suggest to start reading on STM and you will get many ideas of what to start testing with. In general, using mobile pop campaigns for sweepstakes, app install and pin submits are a good starting point. Renmant inventory does not support tracking targets. How did you track targets ? At the time they did not have their traffic split into Premium, Standard and Remnant. So presently you need to test using Standard or just using Remnant to find GEO’s with decent performance and then test the other traffic types. You can also test PopAds or using any other traffic source. Your aggressive link include adult vertical, ZP campaign you set all traffic types, ZP don`t block for it? Well, I don’t use this method too often as its a very beginner method. And no, I’ve not been blocked when using this and targeting all traffic type.